Two friends began peeking over fences to find out how people in cold climates grow their own food. Throughout the beautiful Elk Valley, in the southeastern corner of BC, they found generous gardeners who taught them simple ways to grow more productive and sustainable gardens. In vivid colour, Down to Earth celebrates the viability of cold-climate gardening. Stories, tips, and recipes inspire you to plant a few seeds and create your own food security. No matter where you live, this book will help you meet the challenges of a short growing season. There are many inspiring gardeners who grow their own food and enjoy it year-round. Their harvest makes the zero-mile diet tangible to more than just those living in a warm, temperate climate. 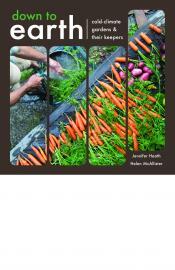 This book is a celebration of the beauty and diversity possible in cold-climate vegetable gardens. It is designed to guide and inspire you on a seasonal basis. We begin with winter planning, then progress to spring planting, the abundance of summer, and culminate in the rewards of a fall harvest. You will also find personal stories throughout the book that provide successful examples of cold-climate gardens. No matter where you live, we hope to inspire you to plant a few seeds, regardless of how large or small your garden space. If you are a seasoned gardener, perhaps you will learn some new tips. Overall, we hope to get you talking about how you, too, can grow some of your own food.